Parse JSON data in segmentation and use them to control other widgets. This widget inputs a segmentation containing a single segment whose content is in JSON format. 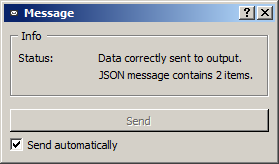 After validation, the data are converted to a JSONMessage object and emitted to the widget’s output connections. Provided that the data conform to one of the formats described in section JSON im-/export format, the JSONMessage object can be sent to an instance of the corresponding widget (either Text Files, URLs, Recode, or Segment) and used to control its behavior remotely. Figure 1: Interface of the Message widget. The widget’s interface offers no user-controlled option (see figure 1 above). The Info section indicates the number of items present in the parsed JSON data, or the reasons why no JSONObject can be emitted (no input or invalid data, input segmentation containing more than one segment). The Send button triggers the emission of a JSONMessage object to the output connection(s). When it is selected, the Send automatically checkbox disables the button and the widget attempts to automatically emit a segmentation when its input data are modified (by deletion or addition of a connection, or because modified data is received through an existing connection). Data correctly sent to output: <n> items. Input segmentation contains more than 1 segment. The input segmentation must contain exactly 1 segment. The input JSON data couldn’t be correctly parsed. Please use a JSON validator to check the data’s well-formedness.